When I discovered I was pregnant with my son I felt compelled to look into the skin care products I was using. I immediately began switching my products to "safer" brands and attempted to solely use products with natural, safe and healthier ingredients. I found companies that manufactured high-quality and safety-minded products and spent a lot of time and money on these products. Although some of the products I found are/were great, there were too few options and the ones I did find were very expensive. In the past, I have always had somewhat problematic skin. So when my esthetician told me I was stripping my skin of it's natural oils, I was shocked. I had always incorrectly believed breakouts occurred because my skin was naturally oily, but my skin was actually overproducing oil because I was drying it out with the products I used. 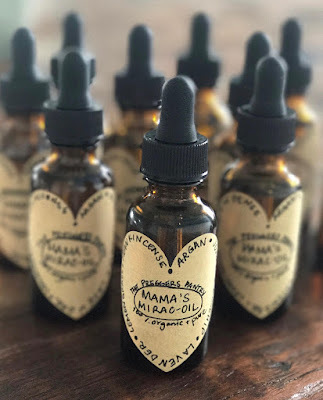 Hormones took a toll on my skin with my first pregnancy, but it was very important to me to source natural and safe ingredients with anything I put on or into my body. I needed something anti-aging, but also something that would control my breakouts. I began researching the best and cleanest facial oils. I bought a few different brands and noticed improvement in my skin within a few weeks. Unfortunately, I only used the tiniest amounts because the bottles were so small and so expensive. So, I immediately began looking into making my own. I learned what oils and essential oils were best for skin, and especially facial skin. I tried many combinations and started mixing and experimenting and finding out what worked best for me. I quickly discovered I could make an oil similar to what I had been using for far less than what I had been spending. I pleasantly discovered I liked the texture and scent of my own oil even better than any of the others I had purchased in the past. Plus, I didn't have to use it sparingly because it wasn't going to break the bank. Using my oil has helped the texture of my skin drastically. The feel and scent is also calming and aromatherapeutic. I use my oil twice a day, all over my face, neck and chest. You could also use it on just fine lines or wrinkles if you prefer. Try it on scars or sunspots too. It has truly been a tiny miracle in my skin-care regimen. My "Mirac-oil" has only 6 ingredients: Argan, Jojoba, Rosehip, Lavender, Lemongrass and Frankincense oils. I have given Mirac-oil to many friends and family members as gifts and everyone has given it the thumbs up, and are coming back for more, which has given me the confidence to start sharing it with others. I currently charge only $25 shipped to you to cover my costs and I am so excited to share it with you! I hope you consider supporting me if you are looking for a facial oil that is clean, healthy, all natural and a game changer for your skin!